The first performance of the Mass took place on 24 March 1820 in the church of Saint Ferdinand, in Naples. The "Giornale delle due Sicilie", on 31 March described the music as masterly, worthy and uplifting. No further performance of the work is recorded. It first appeared in print in Paris in the 1860s in a piano reduction; the score survives only as copies. Only the first sheet of the "Domine Deus" survives in Rossini's autograph. The composer himself separated it from the autograph score in 1846, and presented it to the librettist Gustave Vaez. This complex tale of sources may perhaps be the reason why the work remained hidden from pulic view until the mid-1960s. 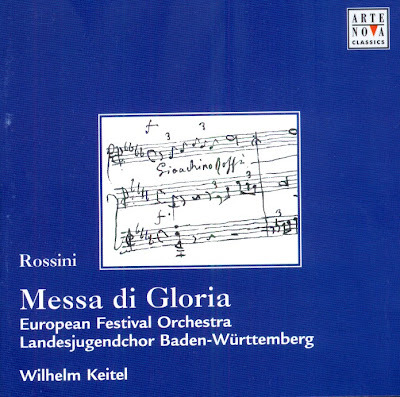 More recently, since the performance under the auspices of the Rossini Opera Festival in Paesaro on 29 February 1992 (the composer's 200th birthday), the work has at last begun to find its way into the repertoire, as one of the most refined examples of Italian church music of the first half of the nineteenth century. The Compact Disc was released by ARTE NOVA, 2000, (DDD). ARTE NOVA 74321777112.